Thousands of young people set their sights on becoming professional actors each year, hoping to get a foot in the door with a solid resumé built in high school, college, and local theatre company productions. But competition for parts is fierce, and no list of credits is complete without competency in the classical works of Shakespeare. 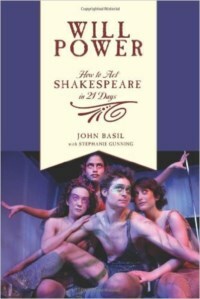 Will Power guides both professional actors and aspirants through a lively 21-day rehearsal process leading up to the day of an actual audition or performance. Actors need never again be confused about where to begin or how to follow through when developing a Shakespearean role. Clear stepping stones have been laid out before them-by Shakespeare himself. Even seasoned actors, familiar with verse, are fascinated when they learn about the acting clues and stage directions embedded in the original First Folio text of Shakespeare's work, in the form of particular punctuation, capitalized letters, and spelling. Putting actors on their feet in dynamic and fun rehearsals, this practical guide helps them develop the 7 Cs of acting: commitment, concentration, conditioning, control, confidence, courage, and clarity while also demystifying how to perform these these magnificently crafted plays.